Computed tomography (CT) remains the gold standard in the diagnosis of urolithiasis but subjects patients to ionizing radiation. Multiple institutions have implemented reduced dose protocols with studies validating their sensitivity and specificity. Stone density measurements (Hounsfield units, HU) have been estimated to guide stone composition prediction and to guide treatment in standard dose CT (sCT) but not in reduced dose CT (RdCT). 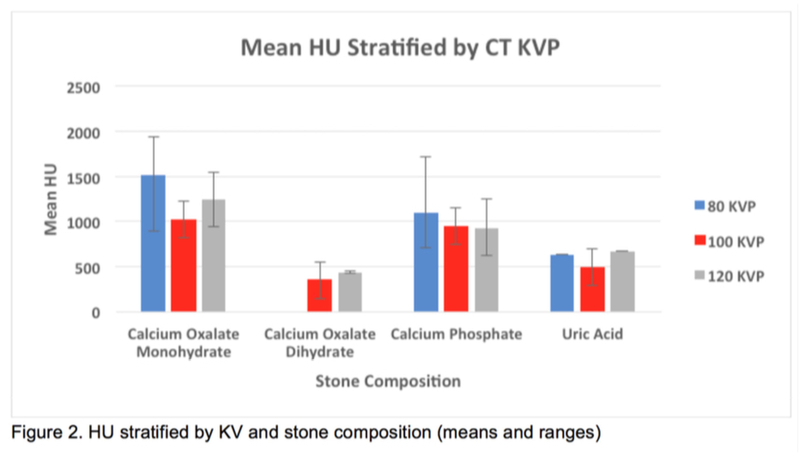 We aimed to compare HU in RdCT and sCT and determine if there is a correlation between stone composition. 201 patients undergoing evaluation for renal colic were prospectively recruited into an IRB approved protocol, whereby each subject underwent a sCT (120 kV) followed immediately by a RdCT (80 or 100 kV). All scans were performed without contrast utilizing automated tube current modulation, 2.5 mm slice thickness, 0.5s rotation time, and a pitch of 1.375. RdCT protocol segregated patients by BMI (80 kV if < 30 kg/m2 and 100 kV if > 30). All calculi <5 mm were excluded to prevent volume averaging and distortion to HU measurements. The iliac bone cortex was utilized as an internal control. We also collected stone compositional analyses. Statistical analyses was performed with SPSS 24.0 using paired t-tests with an alpha value of 0.05. Values are displayed as mean ± standard deviation. There were 36 stones identified in 29 patients. The mean stone size was 7.7 mm (range 5.1-17). 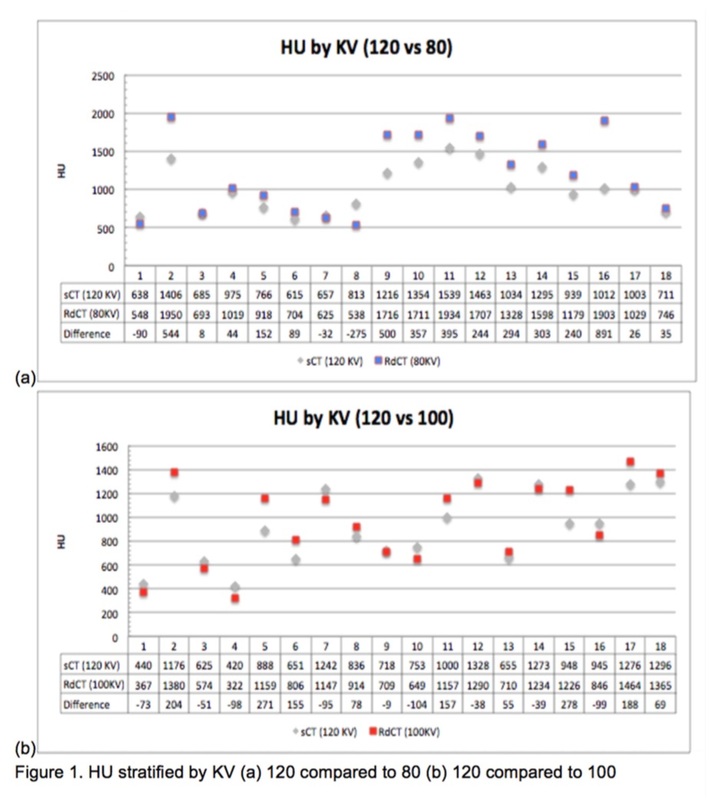 When the same calculi were evaluated with 120 kV versus 80 kV, the RdCT revealed a higher HU (n = 18, 1214 ± 520 vs 1007 ± 307, p < 0.005). Statistical difference was not achieved when compared to 100 kV scans (n = 18, 962 ± 354 vs 915 ± 299, p = 0.151) (figure 1). The percentage differences were 10.6 ± 21 and 1.4 ± 15 respectively. 41 stone analyses were reviewed in accordance to variable CT dosages. The stones' primary compositions were calcium oxalate dihydrate (4), calcium oxalate monohydrate (31), calcium phosphate (21), and uric acid (5). When stratified by CT kVp and stone composition, RdCTs trended toward wider density ranges than standard dose CT (figure 2). Density measurements of urolithiasis in RdCT, achieved by voltage reduction, corresponds to a paradoxical increase in HU. While HU can be used as a predictor for stone composition, there can be a wide deviation in measured density, and this can be further magnified in the setting of dose reduction.